Side dishes are my downfall. I can look through cookbook after cookbook, website after website and pick out hundreds of them that I’d love to make but when it comes to actually choosing a side dish to pair with a protein I hem and haw forever trying to choose one that will work well with it. It’s really not that difficult and I know that, I just have such a hard time choosing. But, it just so happened that I printed out this side dish recipe in between one for pork and one for cupcakes. Since it’d be just weird to serve green beans with cupcakes, I decided it was a sign that I should serve it with the pork. I had some leftover mushrooms in the fridge that were going to go bad soon, so I decided to toss those in as well. 1. Heat olive oil in a large skillet over medium heat. 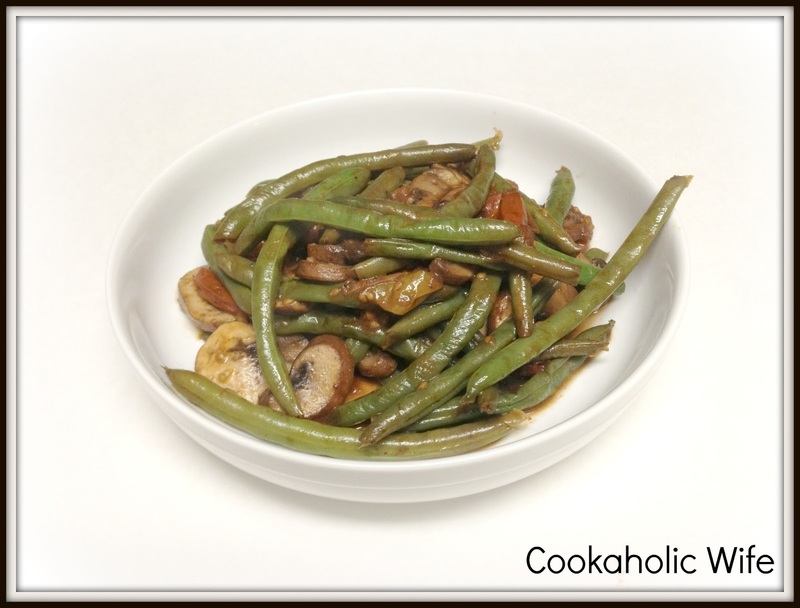 Add the green beans and mushrooms and cook for 3-5 minutes or until lightly seared in some spots. 2. 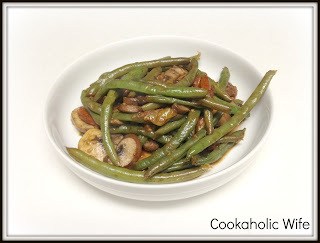 Reduce the heat to medium and cook, stirring occasionally for another 4-6 minutes or until the green beans are soft. Garlic and cherry tomatoes and cook for 2-3 minutes more. 3. Remove from the heat and stir in the balsamic, salt and pepper. Serve immediately. I really enjoyed this side dish. Its something that comes together rather quickly and can be served throughout the year. It also paired really well with the spicy pork dish I made, which I’ll be sharing next week. Yum, you combined three of my favorite ingredients. I have never had them together. Excellent idea!